We had, hands-down, our most fun and interactive giveaway yet. A few weeks ago, we announced our new, bulletproof Noodler's Revolution Blue ink. To celebrate, we hosted a giveaway on this blog and our social media accounts on Facebook and Twitter. The theme was to let your "pen war cries" against the digital age fly. Please e-mail tom@goldspot.com directly with your information to claim your prize. Thanks to everyone for participating in the giveaway! Now, on to business. Christmas Eve is upon us, which is the last possible day to either receive a USPS package or UPS express shipment. 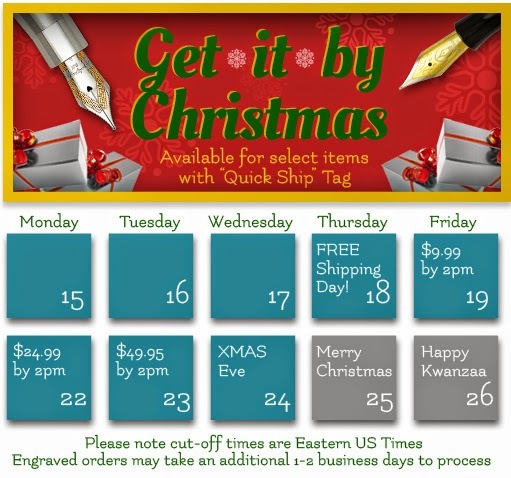 Here is a schedule leading up to Christmas Eve and how much our "Get it by Xmas" shipping will cost. For the remainder of today, Thursday, December 18th, you can take advantage of our Free Shipping Day promotion where there is no minimum to get free shipping with your order. That means any refill or pen ships with $0 shipping charge. This party ends at 11:59pm. Once Friday, the 19th comes, we are offering a special "Get it by XMAS" shipping method. Simply add any "Quick Ship" items to your cart and select the "Get it by XMAS" shipping method during checkout. We guarantee that your order will be expedited for shipment and we will try our best to get them to you on or before December 24th. The "Quick Ship" items are available for immediate shipping, but sometimes inventory can run out quicker than our website can be updated. If this is the case, we will contact you as soon as possible to make alternative arrangements or give you the option to cancel. Although our engraving team is fast at work, churning out scores of engraved pens and gifts every day this month, if you select engraving on your order at this time, it may add an additional day to the shipping time. Visit our website for more details about our shipping schedule. You will still be able to get free shipping on your order of $49 or more, but there is no guarantee that the economy shipping would be able to make the delivery prior to Christmas. As always, call, chat or e-mail if you have a question or need help with placing your order. Happy Holidays!